The corners match up well, it's not to shiny and not to dull. Perfect. I've made it my goto frame for my series of abstracts. Quality of components is great. Instructions clear. Went together easily. And looks wonderful. Because of the size of the image the cost of having the poster framed was crazy expensive. We are thrilled with the outcome. Works great. I change photos and this type of frame "Works for me." My wife, who is learning English, built the frame while I was away. It is flawless and beautiful. She is thrilled. I am very happy. The frame looks great. Durable. Subtle appearance. This frame was perfect for my purposes and I would order it again. Print size: 10.5"x8.5". Frame came out to 14.25" x 12.5". I like it for a small print. The corners met at the front, but not at the back and at first, during assembly, I thought I might not like that, but a year on, I don't even notice it. The mat is PM934 - Pearl. Getting free mat samples is very helpful. You pay a little for shipping but it's worth it to get a few of the sets if you plan on framing several items. I'm a repeat customer and I recommend this company. I like it better than the local big box stores because using the Upload, Preview & Frame option lets me see the finished product better than in a store, from the convenience of my couch. A simple and very high quality frame. Quick assembly. Very satisfied with the purchase..
Ease of ordering, speed of delivery and a perfect fit made this project a great success. These have been a favorite brand and style of mine for years. I use them for photographic art. I will always come back here for frames. I bought this black frame for a mountain range poster. The quality is good. The package includes instructions to assemble it. It wasn't very hard to assemble, but instructions might get confusing. I looked up couple of you tube videos on how to assemble the frame and it took a couple of hours to do it. I like this frame. It's nothing fancy but as good as I expected it to be. Definitely worth the money, would recommend this product. Can't miss with this frame. It's my standard frame for all my paintings. Not the easiest assembly process out there but in the end it is a nice frame! easy to install. it looks pretty good for the price. i ordered 3 of these and they only sent me brackets for 1, but sent out the rest few days later. Frame worked for my project, but cost was rather high. My order arrived but was packed so poorly that only the frame was salvageable. I called customer service and at no cost to me, a second shipment was immediately sent out and this time, packed beautiful and in perfect condition. They have a very good customer service department. Admittedly, I was in a hurry when I ordered the frame and I assumed I was ordering the complete thing; frame, and cardboard backing. The frame arrived and I realized my error - so there it sits in the box in my garage. I'll get the glass and backing locally at some point. Hi thank you for your feedback. Unless otherwise noted, the frames do not automatically come with our Clear Acrylic and foam backing however they can be added to the frame if needed. If you still need the items, feel free to contact us at 1.800.332.8884 between 8am-7pm eastern standard time Monday-Friday and we can arrange to get them out to you. Thank you for your patience. As always, Happy framing! Hello Robert. Thank you for your review. We sincerely apologize that the frame did not meet your expectations. We are happy to offer you a credit on your account being that you had to touch up the frame. It sounds like the manufacturer sent us a blemished piece of framing material. Please keep in mind, we expect all orders to arrive in perfect condition, however, if you experience any issues give us a call. We are happy to send you a free replacement with photos provided. If you need anything, please call us directly at 1-800-332-8884. Thank you so much for your business! ordered a matt and frame. had to put the frame together and there is a gap between the corners. doesn't fit around the matt i ordered with it. very expensive for what i got. Hi Valerie. Thank you for your review. We regret to hear your order arrived in this condition. This is certainly not the experience we wish for you to have. Our customer care team would be glad to help make this right for you. They are available Monday-Friday 8am-7pm eastern time and can be reached at 1-800-332-8884. We appreciate your business and hope to serve you better in the future! the very best solution to my needs. 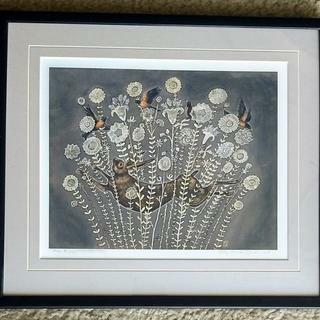 I couldn't find a premade frame for my project so I ordered from you! Inexpensive and light weight. Black goes with almost anything. I wanted a small frame that did not take away from the picture I needed framed. Going to frame a grey scale/black reproduction by grand daughter for her art class final. Complimented my charcoal and pencil artwork. I have used this before to set off tapestries mounted on foam core with fabric covering in place of a mat. Works well. I needed a proper frame for my wife's portrait and this fit just right. I have a poster in which I needed to find a frame that would accommodate the size of the poster. simple and basic style will match my office. Slim, trim and professional looking. We are framing posters of airport footprints, off white image on charcoal colored base. The client wanted a black frame and chose this from catalog pictures. Liked the price for what I needed. I need puzzle frames and these have been perfect for my puzzles in the past. And I also got one to frame a copy of the Declaration of Independence that I found in my grandmother's things. She died in 1971 and must have had this copy for years, so it is quite old and precious to me. I'm framing a cross stitch picture I made. It is perfect for the poster that I plan to display in a powder room. Simple and elegant. I wanted a simplistic frame for this Eclipse picture. Its the "Diamond Ring Exposure". Thin, elegant and professional in appearance. 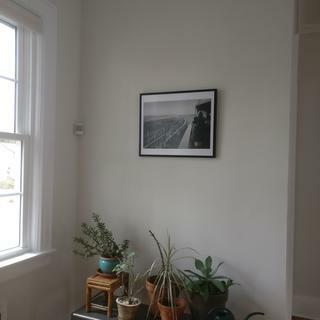 My husband is a photographer and I like to display his pictures in our home. I bought 6 picture frames last year and I like them very much. I chose this frame for a specific purpose, to install in a museum setting with a pre-made backlit display case. It needed to house a transparency label with photo. I needed wider profile on the frame front to hold the Plexiglass in (with no bowing out) with the slide in transparency and soft white diffuser behind the Plex. Slim, trim, and professional in appearance. I needed an odd-sized, large frame that would compliment but not dominate the print I was framing. I went with metal to keep the weight down, too. Not to thick, and not to thin. It's not shinny and not totally a mat finish. Just what I was looking for. i want to frame a 40" x 60" print. I want to prop it up against the wall at a slight angle on top of a mantle. Is this frame sturdy enough to do that? BEST ANSWER: The frame is fairly thin for this sort of a placement, especially if you are going to add to the weight by using glass. I would go with something a bit heavier or consider anchoring the top to the wall with a picture hanger. As yours is a large frame, I’m afraid it will flex quite a bit and placing it on top of the mantle may be slightly precarious. That should work just fine. We hung ours on the wall. In fact we have two of these. The frame is pretty sturdy. It is working that way for us. Sturdy frame, leaning against the wall from a high table. Works great. Rigid. I think the frame seems very sturdy. My picture is considerably smaller than yours, though. This frame would be able to work for your project. Thank you! Will this work for a stretched canvas? BEST ANSWER: Hi Tonya. This frame only has a depth of 3/8", therefore, your canvas would have to be less than that in order to sit flush inside the frame. Thank you! How thin is the border? It looks thin in the product view, but in the full view it looks very thick. BEST ANSWER: Hello Guyang! The face of the frames is 1/2" wide. Thank you for your inquiry! BEST ANSWER: Hello. Please measure the focal point of the artwork that you want to see and order that exact size. You may need to trim down the artwork so that the size will work. 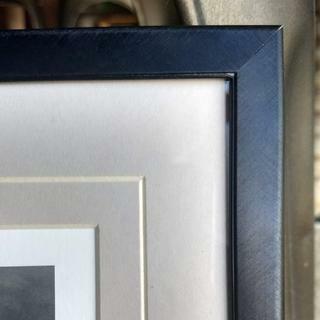 The lip of the frame will only overlap the artwork by 1/4". If you need further assistance, please give us a call at 1-800-332-8884. BEST ANSWER: Hello! The frame does not come with acrylic and foam core backing. This is due to the different framing needs customer have. These items must be added on to the order. The frame does come with retainer clips and hanging hardware. If you need further assistance, please let us know. Have a great day! does this frame have glass? BEST ANSWER: Hello! Thank you for considering us for your framing needs. 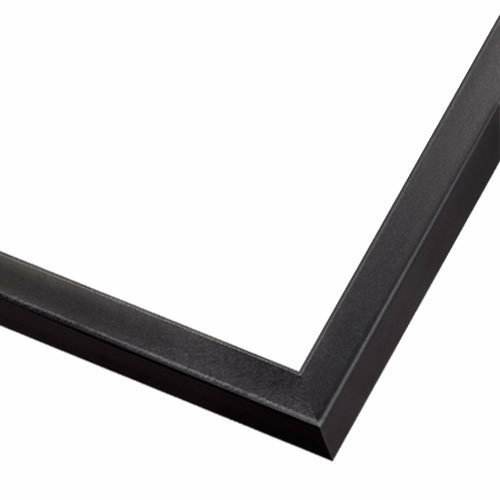 Unfortunately, we don’t recommend glass for frames, we sell picture-frame quality acrylic which is plexiglass. Glazing and backing kits are not included automatically because not all artwork or customers need them for framing. Canvas paintings, for example, would be damaged by glazing of any kind. These are offered as separate add-on items during the ordering process which can be added after a frame size is selected. If you have any additional questions, please let us know. Have a wonderful day!